Safe Catfish – ALL CATFISH SHOULD BE TREATED EQUALLY! FOOD SAFETY FIRST. SPEAK OUT NOW. The USDA has proposed strong new regulations and inspections for catfish. But the USDA now must decide whether to protect all catfish, or just some catfish. You can make a difference. 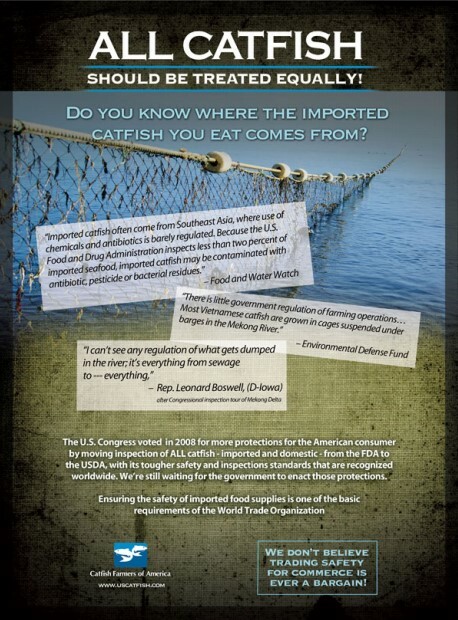 Click here to learn how you can help protect American consumers and make all catfish safer. When you are shopping, look for the label “U.S. Farm-Raised Catfish” for guaranteed high quality and safety. Keep up with latest actions. All Catfish Should be Treated Equally! Safecatfish.com is committed to supporting laws that protect the health and safety of the American consumer. The USDA has determined there is a clear need for a stronger catfish food safety inspection system. 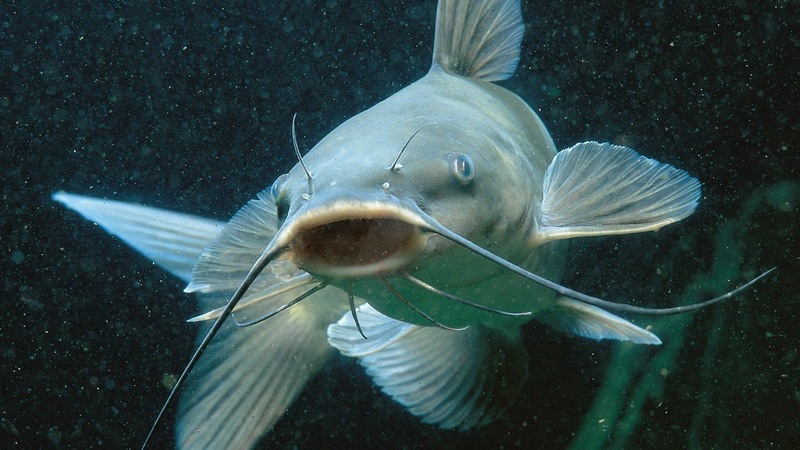 But the USDA now must decide whether to protect all catfish, or just some catfish. — described in the regulation as “all species in the order Siluriformes, with the three families typically consumed as food, including Ictaluridae, Pangasius, and Clariidae. Here’s a link to view all of the catfish campaign print ads. 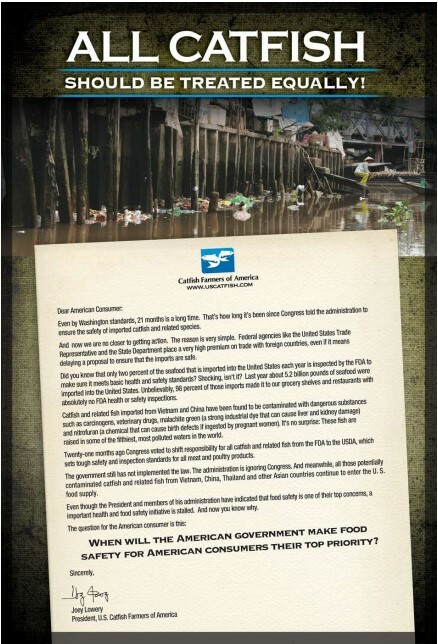 Read these letters which urge Congress and this administration to Act Now! WASHINGTON ­- Seldom do U.S. businesses seek — even lobby for – more government regulation of their industries. But American catfish farmers see federal regulation as the only thing between their livelihoods and financial ruin. A fear of competition from lower-priced foreign imports from Southeast Asia has Texas catfish farmers and their trade groups embracing U.S. government regulation. Steve Klingaman, owner of Aqua Farms in El Campo, says imported fish from China and Vietnam, which he considers inferior and environmentally unsafe, could have a devastating effect on his catfish farm. Already, he’s had to lay off 40 workers. The U.S. government soon may step in to help aquaculture businesses such as Klingaman’s. The U.S. Department of Agriculture is now seeking public feedback on its plan to oversee catfish farming at every stage of production – the first step toward regulating all catfish bound for the United States, whether grown domestically or internationally. Foreign catfish producers say the new rules would violate World Trade Organization rules by unfairly assisting domestic companies. 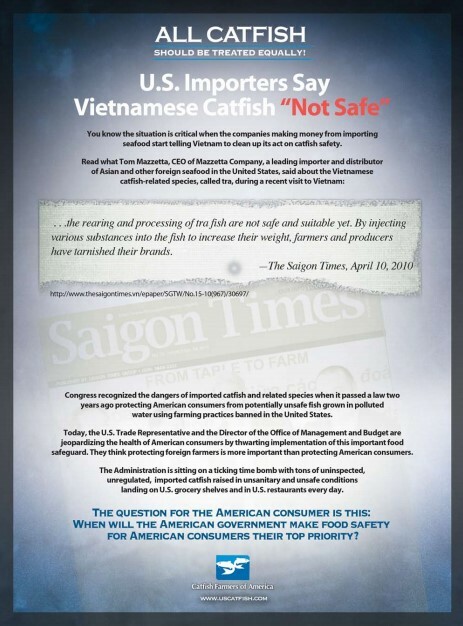 American catfish farmers, however, claim that many fish imports from Vietnam’s Mekong Delta are bringing unsafe chemicals into the U.S. food supply, compared with the largely mechanized American production methods. American catfish farmers sold $403 million worth of fish in 2010, an 8 percent increase from the year before, according to the USDA. The top four states – Mississippi, Alabama, Arkansas and Texas – account for 94 percent of total sales. Texas had more than $13 million in 2010 sales, a slight increase from 2009. Matagorda and Wharton counties lead the state in catfish production. Texans eat 55 million pounds of the whiskered fish each year, making the state the second-highest consumer of catfish, per capita. The federal Food and Drug Administration inspects just 2 percent of seafood, according to a Government Accountability Office report. That’s one reason the catfish industry got behind 2008 legislation on Capitol Hill that shifted oversight of catfish from the FDA to the Agriculture Department, which in the past has regulated meat but not seafood. Their reasoning: The Agriculture Department had more personnel to enforce health and safety rules. The backlash against foreign fish, however, sounds a lot like protectionism to the National Fisheries Institute, which represents international catfish farmers. Spokesman Gavin Gibbons said it is a costly way for catfish farmers to nudge out competition from countries that are selling fish that taste similar to channel catfish at lower prices. “It is not about food safety,” said Gibbons. It’s also about the government’s definition of a catfish. The USDA is seeking public comment on the definition, setting forth two options: A catfish is either any fish in the Siluriformes order, which would include the Chinese and Vietnamese pangasius fish, or it is just the North American native Ictaluridae family. Most American farmers are asking for the broader definition that would require the USDA to inspect all fish imports. If the broader definition were adopted, it would mean the USDA would set up inspection operations in Vietnam and China, or require farmers there to prove their production methods are equivalent to the USDA’s accepted methods. The narrower definition would apply almost exclusively to U.S. farmers. James Bacchus, former chief judge of the World Trade Organization’s appellate panel for eight years, warns that the inspection program might result in World Trade Organization litigation. In his legal opinion on including pangasius as catfish, he said the U.S. would need clear, scientific proof that oversight for catfish is worth the estimated $30 million it would cost and isn’t excluding foreign out of interest for U.S. farmers. Is Your Favorite Seafood Toxic? Tennessee State government in the U.S. has issued a new law to require country-of-origin labeling on catfish products from the Mississippi or the Mekong Delta since July 1, said the Vietnam Association of Seafood Exporters and Producers (VASEP). This is the third state after Mississippi and Arkansas to require restaurants and retail stores to tell customers where they get their catfish, with a view to make catfish safer for consumers and to help level a playing field for American catfish farmers. However, the law will not hurt Vietnamese tra and basa fish exports to the market as the products are not classified as catfish given a 2002 federal mandate, Truong Dinh Hoe, general secretary of VASEP was cited by the Thoi Bao Kinh Te Sai Gon online newspaper as saying. He added that most Vietnamese tra and basa fish products are exported to California and eastern states. Vietnam earned $539 million from exporting 250,000 tons of tra and basa fish in the first half of this year, up 13% and 21% on year, respectively. Need more information about SafeCatfish.com or our campaign?